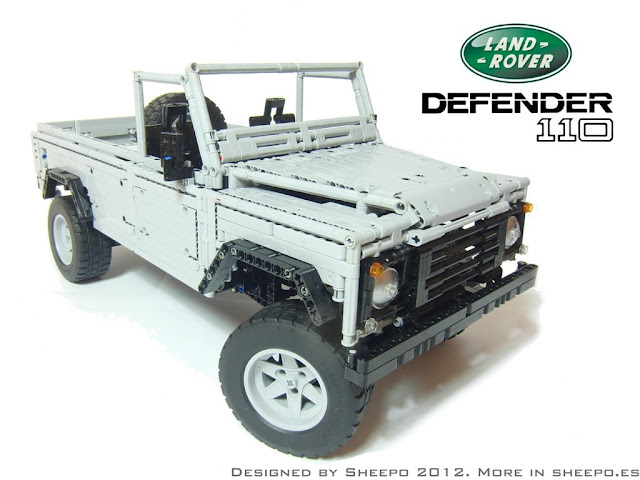 TechnicBRICKs: TBs TechPoll 40 (Results) - Will Sheepo's Land-Rover Defender, pass the CUUSOO review? TBs TechPoll 40 (Results) - Will Sheepo's Land-Rover Defender, pass the CUUSOO review? In the sequence of the LEGO CUUSOO review results published last month, we decided to run a poll to hear what you think. Will Sheepo's Land-Rover Defender, pass the CUUSOO review? As we can see from the result snapshot bellow, opinions are relative divided. Although the majority think it will not pass the review, because of the model huge size, the amount of PF elements used, etc... Unless it would get a slim cut and re-design by the LEGO Designers. Although I would say that if the project is still in consideration, the CUUSOO team might have a plan and likely the decision should be pending on some other aspect. A license agreement with Land Rover maybe or the results for some design concepts that could be eventually ongoing. Maybe Sheepo's creation will be produced as a "Limited Edition" set, with a run of 20,000 copies (just like Egor Karshiev's Lego 41999 "Boss" Crawler set). There is no way at all that this is going to be a set. They already ran the Limited Edition winner of the Technic Challenge, and it's just far, far, far too big. I would bet big money that this doesn't get through, really. stronger CV joints (like 8880 size) and universal joints (like 1.5m or even 2m width but still 3m long), and some kind of indexing gear or linkage for the remote gear change. That's a lot of parts, a big investment but they will all be very very useful in future sets. I'm sure a Lego exec reading this will think "no way are we gonna spend that much on a cuusoo product) but I hope they don't jump too quickly to that conclusion as the technic line is IMHO in desperate need of some serious investment into new parts that will increase authenticity, reliability, play value and overall awesomeness for the future. Sorry, that should be lots of new parts *TO* make the gearbox more lifelike. The current Lego design isn't lifelike and really inefficient. I'd love to see all that new parts coming into reality! With Landrover Stopping production of the Defender - I think Lego may be toying with the exec and Landrover for some farewell executive gifts which would mean at least a limited edition ... ?